So its the time for snacks recipes. Yes, we all welcomed ramadan with great joy. Most of us will be browsing for yummy snacks recipes to make for iftar. 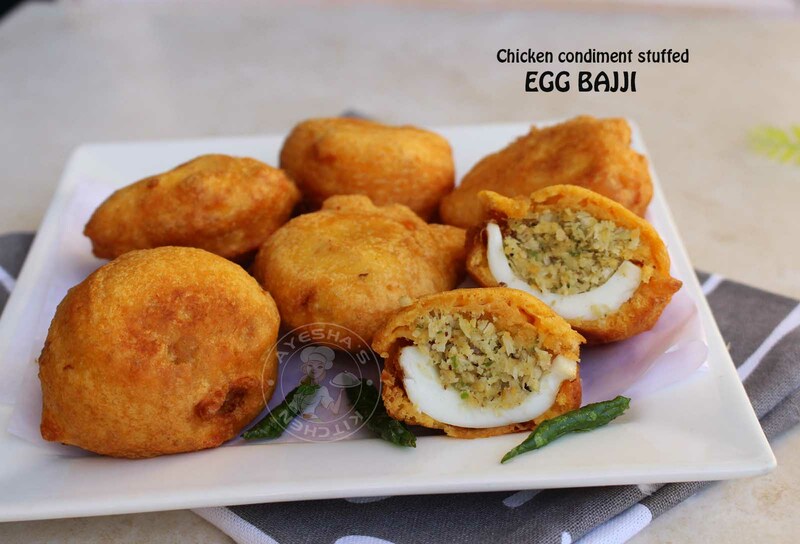 This chicken condiment stuffed egg bajji is a great iftar snack for sure. I always prefer bajji recipes to savor along with tea or as an evening snack on those rainy days. Hot bajjis like mulaku bajji, egg bajji, potato bajji, cauliflower bajji are all time favorite tea time snacks for me. Here am with a twist to normal egg bajji recipe. 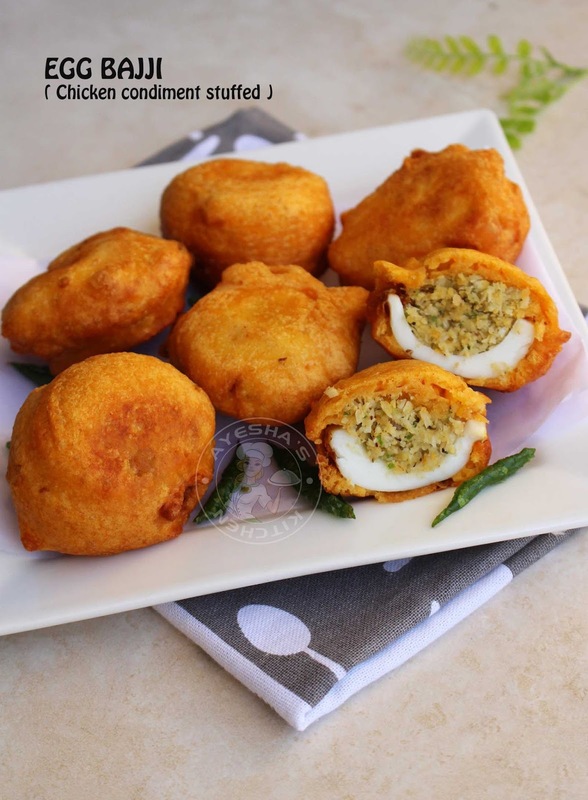 Usually hard boiled eggs are halved and dipped in gram flour batter and then deep fried until golden. Some times my mom used to stuff the egg white with coconut condiment discarding the egg yolk. But here i made this snack more interesting and delicious with the flavor of chicken in it. Yes, we chicken lovers never miss the chance to include chicken flavor to any dish we like. Whether it is a veg snack or it is a veg dish, we somehow manage to add chicken flavor to make that dish more spectacular. Isn't it? This snack is just simple but it turns out super delicious. The only thing you must note while making this bajji is that, the stuffing must be very spicy. Moreover let me say few things regarding the gram flour batter. While making the batter, you must add water little by little to the dry flour until you make a thick smooth consistency. Please to be noted that, the consistency must not be too thick nor too thin. And then dip the stuffed egg gently in this batter and coat it well (If the batter is too watery , then it won't stick to the stuffed egg ). Immediately gently drop it to the medium hot oil and fry in batches. Baking powder added in this batter gives this snack a fluffy and perfect texture. So do not skip this ingredient. 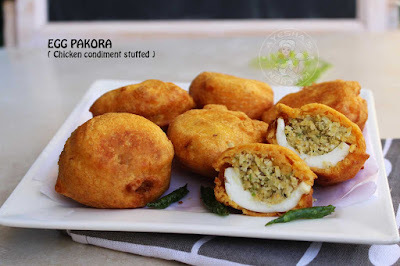 So lets move on to the recipe showing how to make chicken condiment stuffed egg bajji /how to make pakora / bajji /egg snacks /egg recipes for kids / ramadan recipes / iftar snacks /easy snack recipes /easy snacks to make / snack ideas /quick and easy snacks / mutta bajji / mutta pakoda. Hard boil the eggs, peel it, cut them in halves, discard the egg yolks and set aside. For the stuffing - Cook few pieces of chicken with chili powder, turmeric powder and salt. Chicken must be spicy. When done, shred it well and set aside. Crush scraped coconut, green chilies, chopped coriander leaves in a grinder with salt. Add shredded chicken to it and pulse it for a second. Transfer it to a plate and add an egg yolk to it (optional only). Mix them well. Check for salt and spiciness. Stuff the egg white with this chicken condiment mixture. Set aside. For the batter - Combine all the ingredients given under ' for batter ' until smooth by adding water little by little. The batter must be medium thick consistency and should not be watery. Heat oil in a pan or wok for deep frying. Once the oil turns hot, reduce the flame to medium. Dip the stuffed egg in the gram flour batter, coat it well, gently drop into the hot oil and deep fry. Flip occasionally. Serve hot along with ketchup or green chutney.